Whatever will be the view of Obama’s domestic policies, it is highly probable that in the foreign policy arena, he will largely be regarded as possibly well-meaning but naïve and the ultimate cause of terrible international problems and major loss of life, by creating vacuums which have variously been filled by Russia, Iran and China in different parts of the globe. What may appear to have been an initial over-reaction by Prime Minister Netanyahu, turned out to be a clarion call to Israel’s supporters around the world. First to step up, and how lucky and proud Australia and Australian Jews can be, were Foreign Minister, Julie Bishop, and Prime Minister, Malcolm Turnbull, with multiple statements of support for Israel over a variety of subjects ranging from 2334 to the ridiculous so-called Paris Middle East Peace Summit organised by what is one of the most unpopular French Presidents of all time and attended by neither Israel or the Palestinians. However, even Julie Bishop cautioned against “unilateral steps” when Israel announced a very modest building approval of apartments almost exclusively in Jerusalem and/or the established blocks. In early January, a terrorist truck driver murdered Israeli soldiers in Jerusalem. Usually, to our consternation and dismay, only Israel refers to such events as terrorism. And what about such demonstrations of support in response to the truck murders, also unprecedented, as the blanketing of the Brandenburg Gate in Berlin with a giant Israeli flag? Think of the symbolism of that! So now, with President Trump, will the seemingly better diplomatic environment that developed since 2334 continue? In the first instance we should say a resounding yes, at least as far as relations with the USA is concerned. 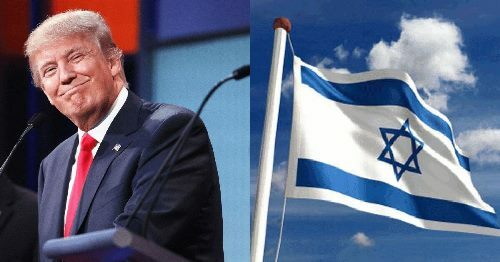 Trump has reiterated assurances that there would be no daylight between Israel and the USA under his Presidency. Clearly and repeatedly. we have heard that he will move the US Embassy to Jerusalem. Previous presidents such as Clinton and George W Bush had also promised to do so, but it seems as if Trump sounds likely to be more serious about this decision. If he does move the embassy, that would be a very big positive long-overdue step and could lead to other countries doing so as well. If he does not after all that hype, you can forget any other country doing so for the foreseeable future. One of the biggest problems that Israel continually faced with Obama came from the wrong-sided advice he was given by a few prominent US Jews. Whoever has the President’s ear and what they believe and say, is critical. In July 2009, at a meeting with the most senior US Jewish leaders, Obama spoke on the matter of “settlements”, which aside from the issue of Iran was the most contentious between himself and Netanyahu. Back to the “war on radical Islamic terrorism.” This depends on the who and the how.